At just 31 pounds, it fits discreetly in most spaces. 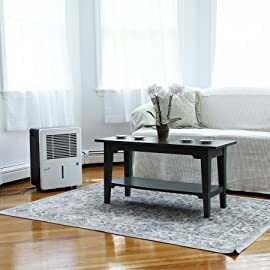 Durable smooth-rolling caster wheels ensure portable ease, and you can customize air regulation with two fan settings, for effective moisture removal in areas up to 2,000 square feet. Remove up to 70 pints of moisture a day for relief during humid months. Simply empty the high-capacity 0.8-gal reservoir upon auto-shutoff, check the level indicator, or hook up the optional hose for continuous draining. A smart Ivation design lets you control moisture levels with a simple LCD interface. Check the humidistat, set your ideal levels, adjust fan speed, program the 24-hour timer, and receive important filter and reservoir alerts for no-hassle operation.